Regarded as a miracle worker by Hollywood insiders, a pioneering German doctor transforms a career’s worth of research into a groundbreaking new face cream. Rewind to last November. 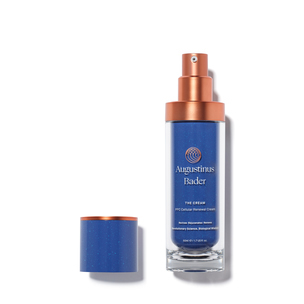 During an intimate dinner to celebrate the launch of KKW Fragrance, Melanie Griffith divulged her latest beauty obsession to our founder Cassandra Grey: Augustinus Bader skin care. Griffith raved that the line’s multitasking The Rich Cream had transformed her skin. A few days later, the actress arrived at our West Hollywood headquarters with Bader himself, a professor of applied stem cell biology and cell technology at the University of Leipzig, to explain the benefits of this incredibly efficacious formula. A little bit more on Bader. The professor, who is a globally renowned expert in the field of regenerative science, holds more than 200 patents and has published over 180 peer-reviewed papers. In 2007, he developed a hydrogel that eliminated the need for skin grafts in some burn patients. Shortly after, he found that his discoveries in wound healing and stem cell activation had applications for the aging process. And thus inspired the development of the Augustinus Bader brand. To that end, the Rich Cream contains a complex of 40 different molecules, amino acids, and vitamins, all found naturally in the body. These ingredients activate your own stem cells and boost them into healing mode, thereby targeting areas affected by wrinkles, hyperpigmentation, loss of collagen and elastin, and other environmental aggressors. Upon use, skin looks instantly plumper, smoother and more hydrated. Even better: upon longterm use, wrinkles, fine lines, age spots, uneven tone, and redness are reduced. Use on clean, dry skin both morning and night. Warm two pumps between your fingertips and apply in an upward, sweeping motion over the face, neck, and décolletage.